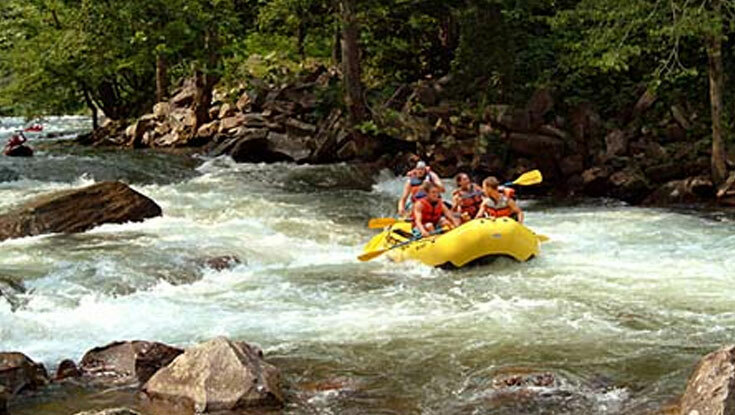 If you're looking for family-friendly white water rafting only minutes from downtown Asheville, check out the scenic French Broad River. On NOC's French Broad rafting trips, you'll explore the third-oldest river in the world, located deep in the rugged Pisgah National Forest. You will learn about the rich history of this river, from its earliest native American settlers to the industrialization of Asheville. You will also see abundant wildlife, including heron and kingfishers, bald eagles, and even an occasional black bear. With its splashy Class II and III rapids, NOC's French Broad rafting trips are ideal for families, children, and young teenagers. NOC is the longest continually-operating outfitter on the French Broad, and our outpost is located approximately 30 minutes from Asheville. Transportation is on own and an office/retail center is located at the Grove Park Inn. Other activities are also offered.